Classically it has been hard for Windows users to modify their iPhones. Mac users get all the cool applications like the Young Invincibles App and such. No more of that! iBrickr is the Windows application that makes it dead simple to modify your iPhone, add and manage custom ringtones, and install third-party applications. For now iBrickr isn't terribly useful. It was designed with the 1.0.2 firmware in mind. 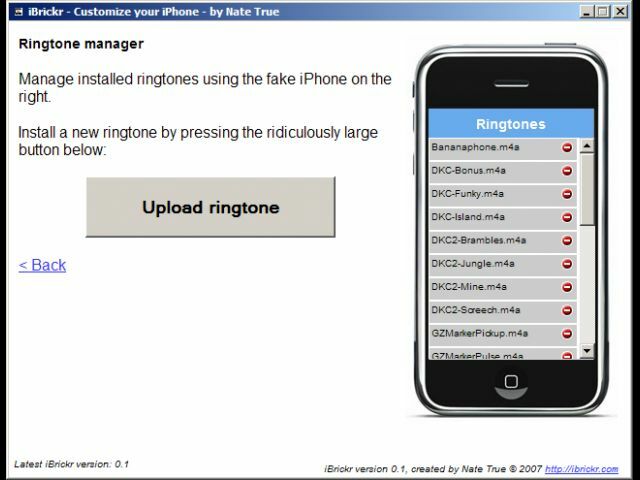 If you want ringtones on your iPhone, check out iPhone Ringtone Maker, which works great even with 1.1.3 iPhones. It's put out by a friend of mine, and it works great. Totally worth the money. - Plug the iPhone in to USB on a computer with iTunes installed. - Press and hold the Power and Home buttons until the iPhone asks to be connected to iTunes. - Use iTunes to restore your phone. - Do not use iBrickr any more, use iPhone Ringtone Maker for custom ringtones or ZiPhone for general jailbreaking and Installer. Yes, that's me in the video! I'm famous! Version 0.91 fixes the iphoneinterface crashing bug when installing applications. Ends up I forgot an essential file in the final archive. Version 0.9 can guide you through the process of downgrading a phone from 1.1.1 to 1.0.2. Note that this will not debrick phones that were unlocked before the upgrade. Firmware download options are optimized, no more accidental restores. Version 0.8 lets you upload multiple files at a time (for NES ROMs and File view only for now), and lets you add ringtones without modifying your phone. NOTE: Unmodded ringtone manager will cease to work properly when iTunes begins letting you buy ringtones. Version 0.7 replaces the Install Application button with "Browse Applications" - clicking an app icon in Browse will download and install it to your phone in one step. Also included is integrated management for NES ROMs, Voice notes, and EBooks for the Books application. These are linked to from the Applications view when you have those applications installed. Version 0.6 supports jailbreaking in iPhone 1.0.2 firmware. New in 0.5 is custom sound management (make custom lock/unlock sounds, keyboard sound, etc) and file management. The interface is designed to read like an interactive tutorial - just download the Zip file, extract it somewhere, and run ibrickr.exe (I'll have an installer soon). Plug in your iPhone and iBrickr will guide you straight through the steps of modifying your iPhone. Once that's done (takes about 10 minutes), you can manage ringtones and applications to your heart's content. If you want to download applications on the go, you can use Nullriver's Installer (PXL package). Just download the PXL to your computer, then install it from the Applications view in iBrickr. If you have any issues, hit the Send Error Report link at the bottom-right of the application. The link will bring up a form where you can review the data being sent, and put in an e-mail address that I can reply to. It's that easy. iBrickr uses the PXL package format for iPhone applications - check the iBrickr PXL Repository for the latest app releases. I been trying to unlock my iphone all night and i get the ibrick to recognize my iphone, but when i try to upload the file lockdownd in /usr/libexec/ the application always crash in windows vista and also in windows xp, so when i restart the phone again it get frozen and i have to install the firmware 1.0.2 again, try it already like for times on both operating systems. Need help from downunder. I bought the iphone overseas. Now im back in OZ and my lil bro "accidentally" updated the 1.1.1 version of firmware on my bloody iphone. what do i do? The phone is completely locked down, it was working previously. Brickr is not recognising my iphone. Now its stuffed, can only make emergency calls. Someone please help this aussie in distress! man im in australia. not canada. thanks for trying anyway. Need help from downunder. I bought the iphone overseas here. Now im back in OZ and my lil bro "accidentally" updated the 1.1.1 version of firmware on my bloody iphone. what do i do? The phone is completely locked down, it was working previously. Brickr is not recognising my iphone. Now its stuffed, can only make emergency calls. I have a mda also but you would need more then that. Are the at&t sim cards good for anything? Thanks nazar.. im looking into it now.. top stuff! This may sound like a silly question but what is AppTap and where do i find it? Im curious I dont think that unlocking the 1.1.1 has anything to do with its software. Why cant we downgrade the firmware in the fieldtest menu of the iphone? Why is firmware spelled firware? need help again. please view the page. any help in downgrading 1.1.1 to 1.0.2?? bought the fone in the u.s. i dont have a at&t sim. using australian sim. now in australia. i have tried the restore process but it fails to work. please help! insert an unlocked sim to activate iphone"
at the top of the fone. the only option i have is to make emergency calls! iPhone 1.1.1 Finally cracked.. maybe.. details coming..
please help me. i've tried about 20 times to use install ibrickr on my phone, but when i get to the part where it says "check again" after the restore, i click it and nothing happens. i've tried so many times on vista and xp, but it never works. please help. thank you. someone, please help :) i downloaded the ibrickr, and so with it, some voice program. now, everytime my i slide my iphone off the lockmode, some woman's voice says: critical system imminent, system shut-down now... blah, blah... i called apple, and they said i must have downloaded some 3rd system program. i deleted everything, including some program that allowed me to get more sounds. i really thought that was it. still think it is, but the voice is still there every time i slide the phone to go into the main menu. help!!! it is so annoyinng and i just got this phone! please please anyone reply to [email protected] WHAT DO I DOOOOO!!!! I`m from Poland and have big problem with jailbreaking. My Iphon i not activated, but i made kind of activation with PhoneActSrv, so Ipod functions are working, but offten pop up mesage that i need compleat activation. I tried to use iBrickr but it canot connect, i even try this trick on not activated phones but any doesnt work. Could anybody give me some sugestions? I tried Itunes 7.3.054 and the newest. Read all this before you start. i found a similar problem on my lap top so i went to hacktheiphone.com, click unlock the iphone, download the itunes.dll and place that in your phonedmg file and also in your ibrickr file. next get a copy of the 102 firmware and place that in: c: documents and setting/"your user name"/applicationdata/applecomputer/itunes/iphonesoftwareupdates. if you cant find the application data file click on tools and folder options and under view tab make sure you can see "hidden files and folders" and that the box us unchecked for the "hide extensions for know file types"
you need to set it up in order to run the jailbreak and ibricker stuff go to hacktheiphone.com and click on unlock the iphone and it will give you instructions on how to set it up. anyone having problems syncing music into their phone? mine throws me out after about 2 min. What version did your phone ship with 1.1.1? Yes yes. more things to share with everyone. This is an exclusive instructions how to reanimate your unlocked Apple iPhone after crusial 1.1.1 Update. Big thanks to russia hacker ax5 who created and tested this hack, all works perfectly. 1. What is â��The Multi-SIM (Mega-SIM or Silver-SIM) Methodâ��? Thus your AT&T and your original SIM-cards remain untouched and safe (in 98% of cases), we wonâ��t need these any more. Or your Apple iPhone must be already unlocked but only if you used, Multi-SIM (or similar Mega-SIM, etc.) and which have 1.0.2 firmware (or lower) and you have casually updated it up to 1.1.1 version. If you have made software unlocking (AnySIM and similar) and in your phone was ANY other (not Multi-SIM card) and you casually or intentionally have installed an 1.1.1 firmware or you casually tried to start any another software unlocking after a upgrade up to 1.1.1 version - THIS HACK WONT HELP YOU! 3. First you have to make your iPhoneâ��s downgrading, it is written HERE! 4. Now you have a SIM-card from chapter 1, you have to insert it into your iPhone and make a jailbreak and activation of your iPhone. In MAC it is done by the software called iNdependence_v1.2.1a (in Windows - I do not know, but in my opinion iBrick will help you). With the same utility you have to open SSH access which will allow to modify your iPhone. Write in a username and password for this access (in IAN the standard - root and pick). Then install one more access - mobile and pick. 5. After that (your iPhone should already work) you write in EDGE parameters for the carrier and adjust WiFi if during this moment you are in a zone of Wi-Fi access. 6. After that you have to install AppInstaller and through it install SSH. 7. Then you have to reinstall all you favorite applications for iPhone. 8. Now You can use your lovely Apple iPhone and haughtily look at those who have used software unlocking (or AnySIM unlocking) because you are the first which unlocked iPhone works after iPocalypse 1.1.1 Update. I think the link for the iBrickr_v8.0's screwed man, its says file is damaged or corrupted if you try to unzip it..
Can anyone send me a working iBrickr v8.0 please..I have this iPhone but i cant use it because of this,hope someone would help..
Hi anyone ;) I found solution fine for me so i share. my iphone is using like a ipod touch! internet those works well, only no idea with youtube this funsion, its always said (cannot connet to youtube ! can anyone help me ? I was installing 1.1.1 from 1.0.2 when I disconnected it from the cradle before it was completed. Now all I get is the "Please Connect to iTunes" yellow triangle. I talked with Apple and they said all I can do is plug the iPhone to the USB and Restore in iTunes. This will wipe the phone clean and put the 1.1.1 firmware on it. I have hindreds of photos and contacts that are not backed up on my computer. I would like to get them off before I do the Restore. Does anyone know if I do a Restore to the 1.0.2 firmware if it will return the iPhone to the state it was in before it had problems? Or if it will simply wipe the memory and do a normal Restore? Any other suggestions to pull the info off? Am I doing something wrong????? Can you help me i'm so pissed and i dont know what can i do. For those of you that ibrickr says check again, do you have the "phonedmg" file set up??? If not go to hacktheiphone.com and it will show you how to set it up(right before step 1). Also place a copy of 102 firmware in the "iphone update software" folder(for location of this file see my earlier posts". use itunes 7.4.1.2, run itunes, connect the phone, put it in restore mode,close itunes, turn your phone off by pressing and holding the sleep button, once off turn it back on(this will take a while for it to restart) now run ibrickr, it should work now. Hi, i'm desperate for help!!! I've been trying to unlocked my iphone for 3 days now, and i'm at breaking point! i've having the same problem no matter what i do. first off i was stuck on the Ibrickr program (couldn't get past the first stage (keep sayin check again). So i read somewhere that i need to install the 1.0.2 firmware, i've downgraded to the older version of itunes, and tried to Restore my iphone to the 1.0.2 but it fails at the end. i open ibrickr, and it doesn't even recognise that my iphones there. (my iphones got no firmware installed) i've no idea where to go, or what to do!?! Hi, i need a big help, also. I was jailbraking my iPhone with iBrickr and the phone stucked at Please Connect to iTunes. It's been 4 hours now and iTunes and iBrickr does not recognize it anymore. I cant restart and can't turn off the iPhone. I restarted my PC reinstalled iTunes, changed USB ports, no result. Tried another computer, the same - iTunes does not recognize the iPhone and the iPhone stays at "Please connect to iTunes". I will appreciate your help. Thank you. do you have a yellow triangle or itunes symbol and cable? Glad I found this. I am receiving my iphone on Tuesday and want to unlock it. In reading the tutorial I have two questions. 1. Is there anyway of finding out which firmware version is on your iphone? 2 When downloading the 1.02 firmware the tutorial says to save it to C:\Documents and Settings\(your username)\Application Data\Apple Computer\iTunes\iPhone Software Updates and I cannot find that file onmy HP TX1220CA running Vista(in cas that info matters). Is that because I havent hooked up an iphone yet so that file has not been created. If not any idea how to create that directory or is there another alternative as this is a little beyond my tech level. Thanks in advance for any help you can offer. graverski: when you connect ot itunes does it tell you restore? if so push the shift key and restore button at the same time, this will give you the option of what software to restore, select the 102, whatever you do dont select the 111. if you dont have 102 download it and place it in the this location C:\Documents and Settings\(your username)\Application Data\Apple Computer\iTunes\iPhone Software Updates. then try the shift and restore again. imapfsr:go to hacktheiphone.com and under the unlock tab follow the tutorial on how to set up the phonedmg folder, you cant see the file because of the settings in the folder options. go through the tutorial. No, iTunes does not recognize the iPhone. Nothing happens when i plug it in. I think the iPhone is stucked there because i can't restart it nor turn it off. After reading a couple of hours i didn't find a solution about that. did you try the home and sleep keys then after 10 seconds releasing the sleep key but keeping the home key pressed? thanks for the quick reply. I did what you said and all worked fine. Just one question. When I downloaded the 1.02 and moved it to the phonedmg folder and then opened my folder there was only one app in there. The 1.02 restore app with a little lego looking icon but in the tutorial there were five or six files in the folder. Did I do something wrong. Thanks again for your help. imapfsr it is the way the file is set up, change the extension from .ipsw to .zip then unzip the file then it should look the other way. Graverski sorry i dont have any other ideas??? seemed to work, thanks again. imapfsr when you place the file in the "iphone software updates" folder leave it in ipsw format. Also your phone may come with the 1.1.1 software if it does when you downgrade you will not be able to make calls but everything else will work. "The firmware on this iPhone is already patched. anySIM will now quit. Please turn off your phone and turn it on again after anySIM quits." My iPhone firmware is 1.0.2 (1C28) and I can run ibrickr normally with the iPhone. Everything is working, but I cant use another SIM card. Can someone help me to identify what procedure I've done wrong and how to unlock the SIM card. rush did you downgrade from 1.1.1??? if so you wont be able to make calls. So, it seems that I have to wait some new version of anySIM that can unlock it, right? OK Folks, I need some help here. I've read this blog so many times that I'm seeing doubles. I've been trying to unlock my iphone for the past couple of days but I can't seem to get it working. The iBrickr won't recognize the restore mode once it's gone through the initial part of jailbreaking. Please help. I'm using iTUne 7.4.1.2. My unit reported 3.14xxx for the firmware so I assume it'd be 1.0.2. I've since then successfully restored to 1.0.2 firmware image provided above multiple times. Is there a step by step instruction for jail breaking using commandline tools? Thank you gonemad for trying to help. In the end I solved it myself. As it turns out, once you've installed the latest version of iTunes on your machine, its next to impossible to get rid of some remnants of it. I had updated to the latest version prior to purchasing iPhone because I own a Shuffle. I read the posts carefuly and before connecting my iPhone, I had downgraded to iTunes 7.3.2.6. It took a lot of work to get there, but eventualy, I thought I had gotten everything. It turns out I didn't get everything. That particular computer will no longer acknowledge iPhone in recovery mode outside of iTunes. The iTunes will recognize it fine and allowed me to refresh the Firmware to 1.0.2, but no other utility iphoneconnect, ibrickr, apptapinstaller, etc, will not recognize the iPhone in Recovery mode. Just my two cents. If someone knows exactly what to look for, like a registry entry or a driver version, etc let me know. Otherwise, be aware that if you load the latest iTunes on your machine, it's very difficult to undo. At least, I haven't figured out a way yet. jyang did you connect it to itunes first then put it in restore mode? how about the "phonedmg" folder? If you've updated to 1.1.1 firmware can you reset and install 1.0.2 firmware and still unlock the iphone? you can install and activate but not unlock in otherwords all the features work but calls. for a tutorial google "downgrade iphone youtube" there is a step by step video with some cheesey music. "gonemad" - i've installed the Anysim v1.02 and it says i should see the springboard with the anysim application on there but i can't see the Springboard at all. it's still on the "active iphone". he iPhone/iTouch Dev guys have been hard at work for weeks and have finally managed to jailbreak 1.1.1. Right now, they're nowhere near releasing a general-use tool but the first steps have been made. Congratulations to dinopio, asap18, netkas, Martyn, mjc, Niacin, BloomFilter, pytey, tE_gU, pumpkin, roxfan, sam, SmileyDude, NerveGas, Nate True, Arminius, DirectriX, ixtli, kroo, zibri, xorl, and the rest of the team. So what does this jailbreak mean? * Third Party apps run. Kind of. We probably have to recompile many of them for the new frameworks because many of them crash. * The iPhone has been activated via third-party workarounds. * The 1.1.1 binaries barely work with 1.0.2 -- at least not well enough to run the music store without major hacking. * The Mobile Terminal App works on 1.1.1. * The entire bsd suite still works -- as do standard command-line utilities compiled for ARM. * 1.1.1 references both com.apple.mobile.radio and com.apple.mobile.nike. * The jailbreak method is nowhere near ready for prime time. So please be patient. i've updated one but not the other. i've got to the point where you install anysim application but it say's i should see the springboard but i dont. it still says i need to activate iphone, any idea where i've gone wrong. Have you gone to Hacktheiphone.com? it gives you the steps and files you will need to activate the phone. I think you need to run the pacay application. Start from the beginning and make sure you have set up the phonedmg folder and have a copy of the 1.0.2 firmware in the "iphone software updates" folder. If you people mind me posting things, just let me know.. till then.. Enjoy..
his morning, we were having a lot of trouble getting third-party iPhone apps to show up properly and run on the home screen. Despite the fact that Apple has added extra protections to SpringBoard and created a list of approved identifiers, iPhone hacker asap18 has managed to port several applications to the iPhone and gotten them to appear properly on the home screen. For now, only 15 icons can be added this way--the last spot appears to be reserved for iTunes. The apps have been tested and are working fine. He has also tracked down an option for International capabilities in SpringBoard, which may lead to foreign language Application support. This will be needed in countries like Germany and France, where the iPhone will shortly debut. This is a developing story, and we'll be keeping an eye on it but remember this success is only in regards to running apps on the 1.1.1 firmware. Unlocked iPhones still run the danger of being bricked when upgraded to the 1.1.1 firmware, so if you have an unlocked iPhone do not upgrade to the latest firmware. Can someone help clarify something for me? I have used iBrickr to add third party apps to my iPhone (running the 1.02 firmware). I use AT&T for my service. I have not installed any software/hardware to modify my sim. I realize that if I were to update to the 1.1.1 firmware, this would break iBrickr and my ability to run third-party apps, but would this cause me problems with making calls or only those people who are can't make calls have a modified sim? Nate! how u doing I need some advice or help! my iphone does not show the yellow triangle but the itunes Icon with the CD and the connect cable image. I try to install firmware 1.02 because I thought this is because my iphone comes with another firmware and all the time I got this error from itunes after trying to install the firmware 1.02 I downloaded too. "the iphone could not be restored. AN unknown error occurred (1)." 1) is there a way to know what firmware I have if the phone is not activated? 2) is there a way to install the firmware 1.02 other than using itunes? or how can I do it bypassing that error above. 3) what are the real step to make a not activated iphone work with ibrick? thanks in advace I hope to hear from u soon! hey guys. i have a few question. is it safe if i update my iphone to firmware 1.1.1? my iphone is not unlock it just has the installer app and other application except the anySIM. I want to confirm first if its safe to update my phone. Aussie you have 1.1.1 see my eairlier post and view the video on the tutorial, you still wont be able to make calls but you can run 3rd party apps. phillypino i dont think you can i think you should just wait it shouldn't be to much longer before they hack 1.1.1 completely. if you read some of my earlier posts you'll see that 1.1.1 has been hacked and hacked completely. running apps and making calls. the hackers are working on making an install procedure for everyone. then the people that made ibrickr will Im sure have a great new version. and if you still want to upgrade to 1.1.1 DO A RESTORE FIRST and do not try to install anything yet. Yo guys, iBrickr v0.9 is out and it guides you through downgrading now. No more guesswork with button holding. cool nate im da first one to download it lol. thnkx for you great work. So it seems that there is hope to my iphone that is unlocked, but fails on anySim. Im posting this message from my iphone wifi access, just waiting to change my simcard. Great job guys. Do you see the "free my iphone" button when you run ibrickr? I just used your Ibrickr 0.9 to downgrade back to 1.0.2 and when I try to download PXL files it gives me an error message that iphoneinterface.exe has encountered a problem.. how do I fix this? also when you place it in the iphone software updates folder leave it in .ipsw format. did you download the 0.9 version? seems to be a problem with the program. give me your email and i will email you a zip of the 0.8, unless you want to wait. thank you for everything, i love you for posting your tutorial. a question. a had an iphone with the old soft (and unlocked), but, silly me, i upgraded it. after that, by using your tutorial i downgraded it (to vers 1.0.2) and i tried to unlock it (iunlocker method). but it doesn't work, can't see the sim, can't call. gonemad, i "reinstalled" 0.8 and now it can't see the iphone. 0.9 still sees it fine. any idea of whats going on? Help, I am having trouble installing anySIM it errors out everytime What am I doing wrong? Shut down ibrickr, stop the phone holding HOME and POWER buttons for at least 25sec. Then open itunes 7.3.0.54 and be sure you have the 1.02 firmware somewhere in your hard drive. Then tell itunes to RESTORE your iphone. Guys, could you help me with my edge settings? I got an unlocked iphone online, installed proxy.pac and preferences.plist via ibrickr version 0.8, and it worked fine about 2 weeks ago. I was only able to use it for 2 days though. Edge doesn't work anymore, even after reinstalling the files , and changing my APN to wap.voicestream.com, and leaving the others blank. I even tried it from ibrickr v0.9 without luck. I'm subscribed to T-Mobile's T-Zones. Any help would be appreciated. Thanks. Hi Nate, congrats your iBrickr ROCKS!!! Is there any chance to ask you to add a functionality to iBrickr? If you can reset springboard through ibrickr when you install an app, you can upload or download files through the usb cable, could ibrickr execute a file inside iphone system files and then download automatically the image screenshot as it does with the other downloads? That will be a nice to have! please tell me what do you think and if my english is not much clear let me know. How do I get the 0.8 version? Thanks! You guys, I'm not having any issues with version 0.9 - I think it might have just been a PXL server load issue. Are you still having problems? I must report with a huge smile on my face.....great success !!!!!!!!!!!! I am now using my Iphone on Rogers with all the goodies. Thanks so much for your help and to everyone who has to do with this site!!!!! You guys are awesome. Shoot I am at work and won't be able to try until after 5 or 6 tonight. Nate, the version 0.9 iPhone comes back to make calls with anySIM? you it could give more information to install? i kinda need some help with ibrickr version 0.9 it is a bit funny because when i click on applications and try to upload installer onto my iphone an error message from windows appears nd tells me to either send, dont send or debug. it reports an error bout iphoneinterface.exe , wen i go back to ibrickr version 0.8 everything works fine. I followed the instructions on hacktheiphone to jailbreak, activate and unlock the iPhone. I used iBricker (v 0.8) and anySIM for this. I was able to successfully jailbreak, and unlock the iPhone. I also installed AppTapp, XLaunch, VNSea, Lockdown, BSD System, Light on it. But now my "Home" button does not work. It works but I've to keep it pressed for like 60-70 seconds at a stretch. So, for example, if I opened "calculator" application or let's say I go to "iPod" mode and then I pressed "home" button to get back to the home page, it wouldn't go back. If I keep homebutton pressed for very long (like 60 seconds or so) it goes back to the home screen. Once it starts working, the home button responds fine after that. For few mins though. After few mins, home button stops responding again and then I have to hold it for 60-70 seconds. I am in Canada, so I can't take it to Apple store. Also, I anyway voided the warranty by doing jailbreak and unlocking. It doesn't look like it is a hardware issue though. Any one else had the same problem? Any recommended solution? I was wondering the same thing.. If i downgrade even with ibrickr 0.9, will i be able to make calls or not? no ibrickr just simplifies the steps to downgrade. Could someone help with my EDGE settings, please? Thanks! bought an iphone in Florida last week with firm 1.1.1 and by following the instructions on here I managed to quickly get activated and jailbroken ( jailbraked? ) anyhoo - I managed to F*** it up and bricked the phone again. However take heart all of you who have done the same - I simply upgraded back to 1.1.1 then went through the process of downgrading etc. I still dont have phone capability, as I cant seem to get Anysim to work right, but the other functions all work. Does ibrickr 0.9 downgrade the modem firmware to allow anysim to work? I have the same problem as onsins in 9.0. When I try to install any application, at the uploading screen I get a windows error. I have windows xp, and in 8.0 the program dowsn't find my iphone. Any sugestions? Vladtelecom, try extracting the zipped files onto another folder before using ibrickr. It should work. I get stuck on the white screen for a very long time on version 9. Any help? Do I need iTunes 7.3.0.54 installed before running ibrickr 9? I used itunes 7.4.1.2 worked great. you need to connect to itunes before you run ibrickr. When do you expect the 1.1.1 jailbreak to be up and running? hey gonemad im tryin to downgrade but when the white screen pops up it just stays there forever..any ideas? to the gents having iphones not being Reccognized by ibrickr., in windows xp and vista it is do to a resent update from windows, well it makes ibrickr software useless, it make ibrickr look like spam or in my other case like worm software even dow it is not, the update un the code disable it so it dose not function at all, I have Pc´s next to each other to of them just go update and the ibrickr dose not work in one of the cases, i was adding some more app´s and it did not see the the iphone at all well at least from ibrickr but from itunes it worked fine, well to make this short it come that it is combination of the windows update and the itunes update at the same time, that make ibrickr not work, so your not going to like this, 1.backup all your data, 2. format and reinstall windows do not recovered becouse it is in the registry, 3. reinstall and update windows like normaly 4. when you install itunes 7.4.2 right after that disable firmware update, 5. install itunes 7.4.2 and restore firmware to 1.0.2 on iphone then jailbreak then you can use ibrickr and it will work fine, 6. this is do to the amount money that ATT is loosing to Apple and in the group is windows wmr software updates for media software and so call update for security. this is my error report. e_/var/root/Media/PXL/DB: No such file or directory*** could this be the problem? I'm having the "iphoneinterface.exe has stopped working" problem on XP with 0.9 also. is there a comment somewhere that i'm missing that explains how to get around this issue? if you are interested in the new exploits in the 1.1.1 firmware here are to new links to look up on developement, and you may help then in one way or an other, http://www.toc2rta.com/?q=blog and here you can get some of the comments from http://www.engadget.com/2007/10/08/iphone-v1-1-1-firmware-gets-the-jailbreak-treatment/ and http://www.tuaw.com/ it is not 100% but you may help who knows you may be the a new hacker in the block. look in this link that explains the if there is time bariable for the jailbreak and restoring in vista you have to use a stop watch wild booting your iphone look at this link http://iphone.unlock.no/#downgrade-1.1.1-firmware this explains 3 way and some the reasons for it, hope this helps. I'm having the same iphoneinterface.exe problem... I think it might be an error from when it installed the pxl installer, but I'm not sure. Finally after 1 weeks i can unlocked fully with fone call worked for iphone downgrade to 1.0.2 If some company or who wanna buy this software i can sell for them,contact me at [email protected]gmail.com.with this soft only 10 mins u can unlock ur iphone. ok, i tested the version 8 against version 9, i had NO problems whatsoever with 8, closed the window, opened 9, and to my suprise it didn't work, closed that window, opened 8 again, and it worked perfectly. dont format your computer your gonna waste time, i have windows xp. Download the lockdownd file (used to bypass activation) and the YouTube certificate files to your PC. You must transfer these files to you phone as described below. Click the upload button and select the lockdownd file you downloaded previously. Here you upload the three YouTube certificate files one by one (data_ark.plist, device_private_key.pem and device_public_key.pem). It will overwrite the ones already on your phone. looks like you have work to do im reading confirmed jailbreaking 1.1.1 and sucess with ssh also a working and non working app list at modmyiphone! will be checking for update! After freeing my phone its all working except i cant make calls. which i know it would not work anyway!! Everything is fine except I cant get any sounds when I use the ipod not through the iphone or through a headset. Can anyone help me in getting the sound back. To unlock the phone i used a combination of ibricker v8 and ibricker v9 as v9 seemed to crash in certain areas. Hi iPhone Users., i have this 1 problem, ive uploaded some jpeg file on my iphone to change the carriers logo at System/Library/CoreServices/SpringBoard.app/ but after uploading, i cant delete it anymore., anyone there who can teach me how to delete those files that i've uploaded using ibrickr 0.8., any reply would be appreciated., thanks in advance!!! Godbless!!!! Hey guys, sorry about the crashing issues with 0.9. I've got 0.91 up now that should resolve them. Thanks for the update, natetrue! i just purchased an iphone from the US and am absolutley not tech savy. Would you be able to help me set up my iphone to work in Canada. I too am in toronto and would appreciate any assistance you can provide. How do i contact you? HI, sorry if this seems stupid, but what is the probable eta on the new version of ibrickr for jailbreaking 1.1.1? can you tell me please where can i find a converter of video files for iphone? Hello, thank you for helping me!! Need help please. Ok I just received my iphone. I assumed it would be running 1.1.1 since it's brand new. Is there anyway to confirm? if you see "firmware 03.14.08, is possible 1.0.2 " ***** disconnect immediately itunes ***** "
and do not upgrade, care !!!! You shut down the iphone and called again, the PC recognizes the iphone when they connect the USB? I started with a virgin phone and I successfully downgraded to 1.1.1. At least I think I did, I followed a tutorial step by step, consulted a friend that knows quite a bit about phones, downgraded the firmware and then I installed Installer.app twice. I ran IBRIKR and it can access the directory but I stopped there. The tutorial I was using started to confuse me because I think it was geared to MAC and it assumed that my phone was already activated?? What�s the next step? Do I activate my phone the 1.02 way? And if I do it that way will I be able to make calls? Can someone guide me to a better tutorial or something� here�s the tutorial I am using. question, I have my first phone that i bought and accidentally updated to 1.1.1(phone was fresh out the box and it was the day 1.1.1 came out and i didn't READ that it said 1.1.1 instead of 1.0.2), i then downgraded to 1.0.2, and installed the anysim but of course it didn't work, it just said phone was already patched, i want to know if the ipsf software will work to unlock it so i can use it??? any ideas NATE?? anyone??? hey nate thaNKS A LOT FOR IBRICKR 0.9 I DOWNGRADE MY IPHONE FROM 1.1.1 TO 1.0.2 AND INSTALL ALL THE APPL YOUR THE MAN DUDE!!! Your application has been scheduled for deletion. Your iPhone will soft-restart when done. but my iphone stays unchanged. I think there may be some thing wrong with ibrickr deamon process on iphone. what can i do to reload or reinstall ibrickr deamon process? thanks alot for ur excellent job! the ready in the list of menus check the firmware version!! Hope this helps to all that dont know what firmware they have. I got this link where its showing a procedure to change the baseband of iPhones that were updated from 1.0.2 to 1.1.1 my mistake (or stupidity in my case). The problem is that I dont even know how to SSH my iPhone and try the method to replace files and change the files there. Can someone more experienced help on analyze this and explain how do I ulock the SIMcard of my iPhone. Can u tell me thanks Nate true! I am following this tutorial. I am still waiting the iphone to finish the process but still the same can u tell me if you see this screen also? hi, i was trying to restore my iphone and everytime i push the restore i get i am not connected to the internet and it won't work but i am connected and my phone is stuck in recovery mode . can someone help please. Hollywood I got the screen sweet and then I reset and nothing I couldnt access the files browsing to continue with the SSH let me c what I can do let u know so we can unlock together I will post how I did it once I got there! ibricker 0.91 : when downgrade sucessful, so can we use the phonecall? I used the ibrick 0.91 to downgrade my firmware and then ibrick 0.91 to jailbreak and the only thing I couldnt make was Check PXL but I used files to upload the lockdown file and then restart Iphone and then IPHONE HACKED finally I got it!!! Just browse FIles and select lockdown file and after uploaded just restart!! dont need to use SSH in my case worked perfectly!!! any question asked me hollywood!! Still haven't completed a full unlock though... One thing i noticed is that sometimes ssh installs properly and sometimes it doesn't install at all... Can't figure out why... I used to have the problem of finding out what the IP address of the phone was. The problem was I couldn't check the IP address because the phone was still locked... So when I was at 1.02, i went into gui and wrote down the IP address before hand..
That video is old, it's for 1.02. So I guess you downgraded from 1.1.1 to 1.02 and then used sim unlock??? Can you make phone calls? alyshayellowspyder - If your phone is stuck in recovery, try using iBrickr 0.91. It has a feature to help you out of recovery mode. iBrickr will recognize your phone is in recover and it will attempt to fix it. i tried pressing the home button plus the top button. it turned off. i turn it back on. now i just see the apple sign and nothing else.. what do i do? Don't panic. You need to do a restore. When that happens to me I do a manual restore to 1.0.2. You can use ibrickr 0.91. (it has feature that reboots your phone). if that feature doesn't come up then just keep playing with the home button and top button routine... don't forget to keep your finger on the home button when you let go of the top button after 10 seconds.... it will eventually work... just keep trying. Just a quick pat-on-the-back for helping open up so many iphone possibilities. A little pay-pal tip would be more concrete and I, for one, intend to do just that. Thanks again. yes I downgraded first because my firware was 1.1.1 I did it using ibrick 0.91 and installed Sim unlock everything seems to work fine!! I know the video is old but help a lot after you downgrade but use the 0.91 not the 0.8 if you downgrade to browse files and upload aplications but if u downgrade as Nate true says using version 0.91 will be working fine like it was for me. One thing when the screen get black in the process after the triangle and a lot of code passing and saying at the end Goodbye Done! just any less than a minute and will end the process successfully restarting the iphone and that's it!! if your iphone does not restarts restore the iphone process again and run ibrick 0.91 it should not take more than a minutes this process if long more like happened to me I just press again home + power button and get the triangle again and again pass ibrick until the process was successfully done! It take a trick to make it work but worth to me and now I have my iphone working sweet!!! PD: itunes is the only thing does not seem to work but I will post once I find a fix. hi, i need to restore my phone thru itunes .i have firmware 1.0.2 and the lastest version of itunes . my phone is in recovery mode and when i push the restore button it says it can't restore because i am not connected to the interenet? thanks. i restarted it like a few times. with apple logo still there, then i decided to plug it onto the dock and suddenly i see the unlocking slide button. i was like OMG. so happy. thanks for the advice though. I make itunes to work!! for those who does not know how it is easy!! get the youtube fix.rar files over the net navigate in your iphone jailbroken using ibrickr 0.91 version. make backup of those files by selecting them and download to your computer. Upload the 3 new files there from the youtube fix.rar file. create a new folder called "activation_records" there also. I got it! thank nate true your 0.91 wow!! can install anything!! Iphone firmware 1.1.1 really hacked finally!!! THIS IS ANDRE HACK ATTACK THANKS TO NATE TRUE!! Thats the error message I receive. then run again and then ibrick works again!!! but keep it in the connect to itunes triangle screen when open ibrick!! if you could be a lil more specific that would be appreciated, are you saying all I gotta do is create a folder and do nothing else and im done and youtube will work? have the same files too. I just uploaded in the var/root/Library/lockdown and was not necessary to upload them in the other one because I think the are connected and show the same files!! THIS IS ANDRE HACK ATTACK FOR FIRMWARE 1.1.1 THANKS TO NATE TRUE!! hello need help with steps and which programs to use for baseband downgrade. I ve done a lot of reading but just going in circles. cant get the winscp to connect. HELP!!! Aussie where can I download the 3 files you speak of I can't find them anywhere? pork!!! use pacay it work just fine. aussie can you help with the baseband???? I never make a baseband downgrade just use the ibrick 0.91 with itunes 7.3.2.6 and sweet!!! also my firmware shown in iphone the 1.1.1 but it is hacked anyway!! everything works!! so sweet!! can you explain how you did it? maybe step by step? gonemad what is pacay i never heard of it and Aussie so just to clarify i don't have to re unlock my phone right, all i am doing is making my youtube work? and u made the folder as well but still youtube is not working i turned my iphone off and turend it back on and still nothing? I just noticed i have another file in there called pair_records/ its a folder i mean and it has a bunch of stuff there too do i just leave that? also the folder activation records i dont put anything isde that? Can anyone advise how to get the '3' Network SIM working on the iphone (UK)? I've managed to get an 'Orange' SIM working through anySIM but'3' comes up with 'Invalid SIM'! Any help, or pointers, will be appreciated. OK someone PLEASE help me. I am obviously doing something wrong.... I get everything up and running and anySIM just gives me an error message!!!!! please email me or direct me somewhere where I can do this and get my phone up and running all the way!!!! Are you now running the firmware version 1.1.1? Do you have access to all the updates? ie:ITUNES on the iphone. or did you have to stay at 1.0.2. Question to everyone else. I can downgrade and hack very easily to 1.02, but I want to be at 1.1.1. I don't want to modify the baseband to unlock by using anysim. I almost make it to the end but sometimes SSH installs and sometimes it doesn't. SSH I install with this tutorial. sometimes it doesn't work though? i have a question. when i use ibrickr, i got the ringtones uploaded, but somehow the applications won't work. every time i try to upload it. there's an error message saying "iphoneinterface.exe has encountered a problem" and the options to send report or don't send. does anyone know whats wrong? I browse application any sim to my phone & I run from the phone . but my i phone dont read my sim card!!!! I have an older version of ibrickr and want to upgrade to the latest version. Are there upgrading instructions? I'm clearly not figuring this out on my own. scroll up to the top of the screen.....jeesh! hi everyone..my iphone freezes...that means any application wont work even the home button...hafta press the power and home button to restart...my phone was originally 1.0.2 and never updated...im using the latest version of ibricker which is .91... i need you guys...thanks..
You might need to do a restore. You should be able to do a restore with the latest ibrickr.